What better way to say "Hey! this car belongs to an Embedded Systems Engineer!!!" Of course when I get one, it will be some swanky one with AUTOSAR compliant interconnected (via FlexRay/LIN/CAN) ECUs. 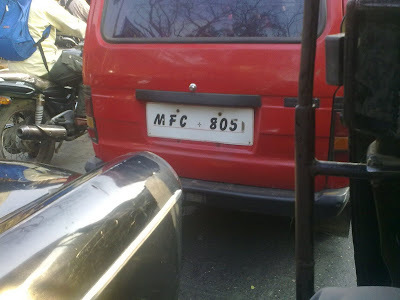 By the way this number plate is actually cool in one other way too... MFC stands for Microsoft Foundation Classes - which projects the image that the owner is a complete hardware AND software geek!! Running MFC based apps on 8051 - now that would be something. In 1987 when I joined MSc course in Delhi University a Maruti 800 used to be parked in the parking of DU's South Campus. Number MFC 0002. Interestingly, DU South Campus runs a post graduate program called Masters of Finance and Control. Beat that. In versova there is a black and yellow taxi wala whose taxi's number is "MCP 420". He doesn't wanna sell it to anyone.